The Pye P75 is a five valve (including the rectifier) 3-band table set in a wooden cabinet and working from AC mains. The short range is 16.3-51.8 metres. The valves used are:- ECH42 - EF41 - EBC41 - EL41 and EZ41. the cost in 1953 was �15-02-1d plus Purchase Tax. Made during WW2 for factory workers possibly at Chelmsford and assembled from a National HRO chassis. The tuning gearbox and chassis is black indicating an early HRO, also the crystal section and I.F. coils are original. Instead of a plug in coil section a permanent set of coils has been installed behind a blank panel, a wave change switch is included for Long and Medium wave only. The set might have been made by an employee of Marconi as there is no Manufacturers mark although the set is professionally made, only a large 'M' across the speaker. It was donated to the Museum with verbal provenance relating to its origin. No other information is known. The Roberts Model R66 has a Ferrite rod internal aerial and is a 2 band 4 valve portable which can be operated from All Dry batteries or AC mains. Wavebands covered are 182-580 Meters and 900-2000 Metres. In April 1956 it cost �13-19-6d Batteries and Purchase Tax Extra. Ever Ready made portable wirelesses until 1968 when they reverted to making batteries only, this model was made in July 1956. Using a ferrite rod internal aerial, a 2 band All Dry battery portable with 4 valves, the wavebands are 192-550 Metres and 1040-1765 metres. The valves used were:- DK96 - DF96 - DAF96 and DL96. Cost in 1956 was �10-10s Batteries and Purchase Tax extra. Philco portable mains battery valve Radio of 1956, has a plastic case with a torch embedded in the tuning knob on the side. The sales literature states ''Powerful built in torch. 3 Bands Long Medium and Maritime. Choice of four colours. AC/DC Mains operation. Cost in 1956 18 Gns Tax Paid''. Uses four miniature valves, DK92, DF91, DAF91, DL94. The British Broadcasting Company Ltd was a British commercial company formed on 18 October 1922 by British and American electrical companies doing business in the United Kingdom and licensed by the British General Post Office. On 31 December 1926, the company was dissolved and its assets were transferred to the non-commercial and Crown Chartered British Broadcasting Corporation. The BBC had to be paid for by public subscription ie listeners were required an annual licence. All manufactures were legally bound to obtain a licence from the Post Master General, before producing their Wireless Sets. The licence shown was issued to Thomas George Morris Asquith 93 Vale of Heath Road, Port Tenarth, on the 15 of January 1930, Cost 10 Shillings. "Commemorate your association with "His Masters Voice" during Coronation Year". Portable receiver of unknown make marked BCM/CWC, built on a wooden board and hand wired known as breadboard construction, although portable it required three batteries HT, LT, and Grid Bias, with a good aerial and earth. Breadboard wireless with 2 valves, it requires headphones or High Impedance speaker for listening and three batteries, it would also require at least one hundred feet of aerial and a good earth. Supplied as a kit, complete with instruction book and original receipt. Two valve TRF receiver made by the Brandes Corporation in Canada 1924, similar sets were made in Slough England, and a later model the 3A was launched around 1929 with 3 valves. The set requires 3 Batteries and listening is done via headphones of which the Brandes version are shown, the headband is missing. No more is known about these sets. Only 40,000 "Masterpiece" wireless sets were made and were given away free in exchange for coupons from packets of cigarettes in 1930. The cigarettes in question were "Best Dark Virginia", and in order to qualify for a free radio, it was necessary to spend over �12 which would have purchased 500 packets of ten. At that time the price of receivers was very high, because of a protection scheme run by a cartel of British manufacturers. The valves that were used had to be British, and the royalties had to be paid to the Marconi Company and the BBC. The sale of cheap foreign imports was banned but giving them away "free" wasn't, so this loophole was exploited in order to sell more cigarettes. The receivers were made by KB but cheap imported valves were supplied by the tobacco company. The KB shown here is one of the earliest Bakelite-cased models and is an extremely neat design using a TRF circuit around a couple of 2-volt valves. The lid which carries the loudspeaker hinges up to reveal the tuning and reaction controls. Unfortunately although the receiver is very small, the batteries were standard and had to be employed externally to the set. This changed the neat receiver into a bit of a messy affair with its trailing leads and collection of batteries. Kolster Brands FB10, was known as The Toaster Radio, two versions were made AM and FM types, both 5-valves including the rectifier. This version (AM) is a 2-band Superhet using an internal aerial, both powered by AC mains and an auto transformer is used to reduce the problem of heat inside the case. The valves used in the AM model are:- 6BE6 - 6BA6 - 6AT6 - 6V6GT and 6X5GT. In September 1950 it cost �8-17s-1d. Although appearing complete the tube is a later radar type and the scan coils are missing. Housed in a wooden cabinet it has 17 valves and a 5-inch CRT (Cathode Ray Tube). The TV section is single band only whilst the radio has LW MW and a short wave on the 16.5-52m band, the set operated from AC mains. In 1939 only one BBC channel was transmitted this being limited to just a few hours each day, therefore a wireless section was added to improve sales. Made in 1938 this set when purchased cost in January 1939. �30-09-00d. 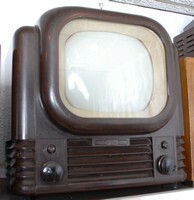 The Pye LV30C single channel Television (BBC only). Housed in a wooden cabinet and having 14 Mullard valves and a 9-inch CRT (Cathode Ray Tube) working from AC mains only requiring 50 c/s to receive the transmission correctly. 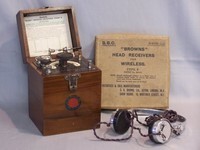 A series of sets were produced known as BV30 and BV51 models, required for reception in the Birmingham area. First sold in June 1950 for �38.11s.8d PT extra. The Microvision TV1B was launched in the autumn of 1978, it was 4 inch x 6 inch and 1.5 inch high. Its predecessor the TV1A sold for around �230.00, it weighed 26 oz; this made it ounce for ounce more expensive than Silver. The picture could be viewed from a foot away. Functioning on VHF and UHF bands, it was the world�s first multi-standard receiver. Small Television screen magnifier. This was filled with liquid and strapped onto the television to magnify the size of the picture, it did however create some distortion. Many visitors to the museum remember using one of these. 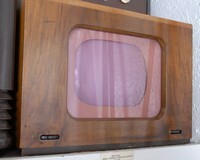 A small Television screen magnifier, this one is tinted pink. It was filled with liquid and strapped onto the television to magnify the size of the picture, this would cause some distortion. The Bush DAC90 is built in a Bakelite case using an internal round coil as an aerial, there is no socket on the rear for an external aerial, the sensitivity of this set makes this arrangement very effective. Not so well known as the DAC90A (item A1010) it is a 5-valve including the rectifier 2-band Superhet working from AC mains. The DAC90A was a complete redevelopment of this model. The valves used in the DAC90 are:- CCH35 - EF39 - EBC88 - CL33 and CY31.The DAC90 cost �11 gns in July 1946 and was replaced by the DAC90A in Feb 1950. A Cream Bakelite version was available at Extra cost. Available also with a cream cabinet it is a 5-valve including the rectifier 2-band Superhet working from AC mains. The wave-band ranges are 187-550m and 1,070-1,900m. Valves used are:- UCH42 - UF41 - UBC41 - UL41 and UY41. This was one of the most popular sets ever made, and is still in use today. They are often seen at fairs. It replaced (and not to be confused with) the DAC90 (item A0148). In Feb 1950 the DAC90A Cost �12-1s-8d plus a premium for the cream version, purchase tax extra. This is the version that superseded the DAC90 (item A0148), which has an expanded metal grille, and with the same valve line up but without the internal frame Arial, (Required an external Arial) also it has a cream plastic speaker grill. The cost in May 1947 was �17-17-03d including Purchase tax. The Bush VHF90 has only Medium Wave and VHF FM Bands and has internal aerials for AM and FM, with an external VHF Arial connection. Housed in a plastic cabinet these sets were AC/DC meaning, there is no transformer inside, therefore no isolation from the mains, it also has an aluminium chassis making it lighter but more expensive, (most chassis for sets of this type are made of steel). It had seven valves including the rectifier these were:- UCC85 - UCH81 - UF89 - UF89 - UABC80 - UL84 and UY85. A VHF90C version was also produced, with the only difference being an AM Arial connection on the rear. In July 1956 it cost �16-12s-08d Purchase tax extra. 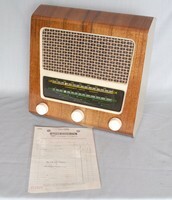 Donated by Mr Edward Allner and given to her by the British Wireless for the Blind Fund. Usually found in Garages or Cycle shops for charging Wireless Accumulators. Supplying 20 Volts, it can charge 10 X Accumulators at one time. Davenset Chargers are still made today. All the museum trutees can remember their parents taking an Accumulator to be re-charged. This is the BTH Type 'C' Form 'A' twin detector crystal set manufactured by British Thomson Houston Ltd. in 1924. It bears the BBC/Post Master General stamp marked with the GPO Reg. No. 106. * The lid carries the instructions for use. The date of manufacture is printed in the lower left corner of the instruction card. This crystal set was manufactured by BTH from 1922 through to 1925. *All manufactures were legally bound to obtain a licence from the Post Master General, before producing their Wireless Sets. The set is housed in a walnut cabinet and features variometer tuning, twin cats whisker detectors and selectable aerial coupling. Known as the 'Brown Microphone Amplifier' it was initially designed to amplify telephone signals,although called a microphone amplifier it is not used with a microphone, this refers to the working mechanism which is purely mechanicle. In the 1920's a license was required for valve equipment, this unit cost half the fee. A wireless set or crystal receiver could be connected to these units and enough power could be produced to enhance the sound considerably. With a six volt battery to power the unit it would consume less power than an equivelent two valve system. In 1924 this model for valve sets cost �5.5s.0d. 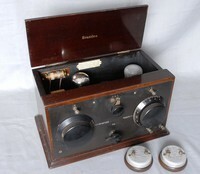 Sold as a kit using the trade name GECophone in 1929, it has a metal chssis and front panel with oak end panels and lift up lid. It is a battery set and has 3 valves. There are two waveband coils six condensors, an L.F. transformer and little else. Requiring headphones aerial and earth. Many small companies sprung up in the 1920's making wireless sets for sale. These unfortunately soon suffered from the large companies going into mass production and flooding the market. This receiver has six valves four of which are RF amplifiers, Long Medium and Short wave making it ambitious, as Superhetrodynes had not yet become widely available,so much amplification must have produced a lot of unwanted noise. A label on the set says Made by J.Karslake & Son 264 High street, opposite the Post Office. Exeter 2510. The cans are copper and the coils plug into standard B4 valve sockets. The covers were vital for a stable receiver so that there was no unwanted coupling between the amplifying stages. Many houses in built up areas did not have gardens large enough to acommodate an aerial, (flats had no gardens) so an aerial for a receiver was a problem. The frame aerial provided some help, mounted on the top of the set, it could provide some signal strength, but not as good as an outdoor aerial. The item shown is a single valve receiver made by GEC using a HE3 Valve. Advertized in Exchange and Mart and other periodicals, and aimed at young enthusiasts. 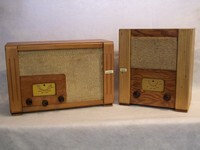 Museum staff remember listening to radio Luxemburg on these sets in the 50's and 60'S. Radio Luxembourg was a Long Wave commercial radio station that began broadcasting from the Grand Duchy of Luxembourg in 1933. The Marconiphone P20B is housed a small jewellery type case with a sprung held lid and with an internal aerial. It used miniature parts throughout and is powered from a HT and LT battery combined in one unit. The valves used are:- X17 - W17 - ZD17 and N17.In December 1948 the P20B cost �11.19s. 6d, plus Purchase Tax. Seven Transistor Miniature Pocket Radio, popular in the 1960's. This really is very small and does fit into a pocket quite easily, compared to the Selecta Portable item A0147 40 years earlier, things had come a long way. Made by the Marconiphone Company and also supplied by Ever Ready who had developed a small battery incorporating HT and LT sections specifically for sets like this. The set weighed just 3lb-10oz's and was advertised as a handbag portable wireless. It is a single band Superhet using four miniature valves and having a switched sprung loaded lid. The valves used are:- X17 - W17 - ZD17 and N17. In June 1947, it cost 10 Gns. 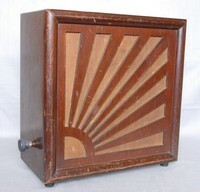 Large early portable receiver, made in 1929, with four valves and space for HT Battery and LT accumulator.Required a good aerial and earth, a hand written list inside the front doors gives all the control settings for various stations. Tuning was accomplished by plain amplification T.R.F. (Tuned Radio Frequency). In 1929 it cost �33.12s.0d. On the inside back panel is a meter to indicate the charge state of the accumulator. Also available as a suit case portable, and a mains version. "Complete with Semi-Opal Protected Detector, D.L.5 Crystal and "Pallmadium" Cats whisker". It sold for 10/6 (10 shillings and six pre-decimal pence), or 52.5 pence in today's terms, This price was very competitive, cheap alongside other models of the time, which might have cost in the region of �1 to �5. Made around 1968 and costing �2-10s-00d, this is really tiny and was announced as the world smallest Radio, it has two dials and a crystal earpeice in a plastic case. This set is similar to the Marconiphone P60B and is a 2-band (MW and LW) portable Superhet set which could be housed in a grey or cream plastic case, using an internal ferrite rod Arial and a printed circuit board, with three valves and two transistors in the output stage to reduce power consumption. Models 1410B came in blue and 1410G came in a grey case. The valves used are:- DK96 - DF96 and DAF96, plus two Germanium PNP transistors. 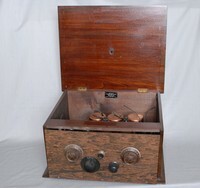 Wood Cased Wireless with rotating needle dial, Mains only, Made by the Hale Electric Company Ltd The Etronic ETA 521 Is a 2-band MW and LW Superhet powered by 200-250v AC mains receiver mounted in a wooden case and using 5 valves namely 6K8G - 6U7G - 6V6G AND 6X5GT. Purchase price not found. Made during WW2 and tuned to German local frequencies only. Known as 'Die Goebbelsschnauze' ( The Goebbels Gob ) This is the Deutscher Kleinempf�nger DKE38 made by G. Schaub in Germany around 1938. 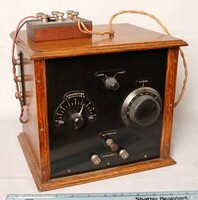 It is has 1 valve (plus rectifier) and is a mains TRF receiver housed in a brown bakelite cabinet. its design is simple and whilst it would have been adequate for receiving strong local stations, it would have required a good aerial. Many of the parts used in this set are marked with the German eagle. This is a domestic receiver of 1968 receiving AM and FM with 6 bands, fully transistorised and used by wireless amateurs in the early 1970,s operating from battery or mains. It used Germanium transistors which suffer badly with age, it is unlikely that any of these sets will still work without major repair. the ranges were 88-108 FM, AM 8.5-22MHz, 3.5-8.5MHz, 1.5-3.5MHz, 550-1500Khz, 150-350Khz. Desk top Receiver in metal case. 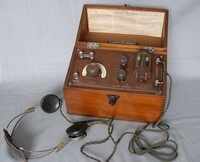 Designed as a communication set for wireless amateurs. In 1947 this would have cost �42.00 A 3 band general coverage set HF 1.7-31MHz.Using an EF39 in the RF stage. 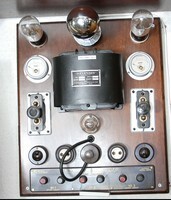 Made in 1949 with 5-valves including the rectifier, a three band Superhet, short, Long and Medium wave. Mains only operation, and requiring an external Aerial and Earth connection. Switch-able tone control and four separate glass scales with cursor, one for each band, individually illuminated when chosen. 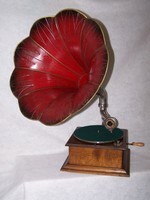 Sockets at the rear are provided for a gramophone pick up and an extension loudspeaker. The valves used are:- TH41 - VP41 - HL41DD - PEN45 and UU6. In January 1949 the Murphy A122M cost �22.00 Purchase Tax extra. This early Car Radio would be slung under the parcel shelf with an external loudspeaker mounted either in a separate box or in the back parcel shelf. The power unit (missing) was bulky and noisy, so it was either under the bonnet or in the boot of the car. Model CN430 "Lady Anne" used a new range of low power valves had 2-bands MW and LW and was housed in a small wooden box with a hinged lid. It could be powered from AC mains or a small combined "All Dry" HT and LT battery. The valves were:- DK96 - DF96 - DAF96 and DL96. 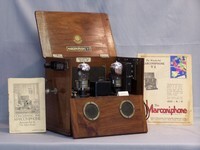 Vidor "Lady Margaret" model CN429 is a four valve 2-band Superhet personnel portable in a wooden case working from an "All Dry" Battery only. Its Lid has a switch which turns on the radio when opened. The valves used are:- DK96 - DF96 - DAF96 and DL96. 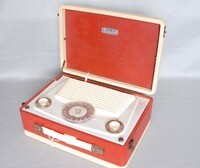 This is the battery only version of Accession No1034.The 'My Lady Anne' portable. In June 1954 this cost �9-2s-10d PT Extra. Supplied by Philips Lamp Co in August 1938. Made by Mullard as Model MAS24. The wooden cabinet in dark wood stain is in almost perfect condition. With square dial and revolving needle tuning, this is directly controlled by eight buttons each can be tuned to a selected station individually. 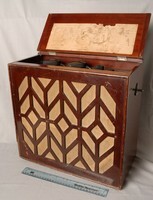 A special type of tuning condenser is used for this designed by Philips and known as a "Beehive" tuner (see item A0745). The valve used are:- EF8 - EK2 - EF9 - EBL2 and A21, also a tuning indicator EM1. Purchase price not found. Frame Aerial used with early Wireless sets when a long Aerial in the garden was not possible. Ediswan Compactum. 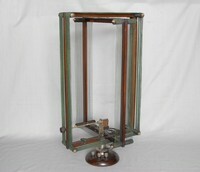 Supplied in the 1920's as a kit costing �4 or complete and tested for �11- 11s. Required a HT and LT batteries with a good aerial and earth. Listening was by headphones. The receiver could be worked with any triode valve of the period, dull or bright emitter type. 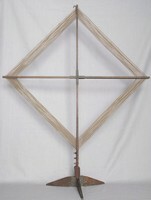 Internally a high resistance coil with a permanent magnet through it was used to move an iron reed, attached to a rod on which was placed the paper cone. An Adjustment was provided for maximum efficiency. This method did not require a strong magnet to operate, and the quality was inferior to modern loudspeakers which use the moving coil principal. Extension Loudspeaker for transferring the wireless to other rooms, with fret cut out to the shape of 'The Thinker' sculpture. On the the rear view can be seen the adjustment control for the Moving Iron Loudspeaker, it was necessary to occasional correct the clearance of the reed or armature, to keep the unit working properly if this was not done loud volumes would cause thumping or sticking, the unit needed to be able to give good sensitivity for all volume levels. Extension Loudspeaker for transferring the wireless to other rooms, with fret cut out to the shape of a Stag. Designed to replace Headphones on early Wireless sets, before loudspeakers had been perfected because of problems with a strong enough magnet. The coil is a high enough impedance to connect directly to the output valve of the set. The terminals on the units would carry high voltages, and yet no insulation was thought necessary. A selection of loudspeaker horns from the 1920's and a Bakelite Philips Loudspeaker from the 1930's. The Revophone Crystal Set 1923 Cost �2-10s Royalty was extra at 7s-6d. Its wooden box with hinged lid is in excellent condition, inside are two knobs and the crystal holder. Midget radios became popular in America between the wars as new smaller valves were being developed, this is just one example made in 1939 it has 4 valves including the mains rectifier, and a simple TRF circuit design. 2 valve reflex circuit, manufactured between 1922 and 1926. Original cost �22.8s.0d reducing to �15.16s.2d in 1925, and to �8.0s.0d in 1926. The McMichael Mains Three of 1931 was a three valve TRF receiver that was built like a Tank, with a metal back and no expense spared on its construction. In 1931 it cost 20Gns. Valves and Royalty's included. The Mains Three is what is known as a 'landmark set', i.e. 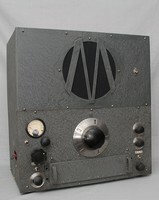 it introduced a significant or interesting feature into radio design. In this case, it was the first radio to have a dial calibrated directly in wavelength (metres) - up until then dials/knobs were 0-100 with a look-up table. Thanks to (www.McMichael.org.uk) David Cochrane. Their sets were very solidly engineered, and made to a high standard. The company went to a lot of trouble promoting the radios. Publicity was helped by demonstrations of their sets' abilities to receive on trains and aeroplanes. These tests were probably less severe than the public imagined, but they were good publicity stunts. Their sets were sold mainly by accredited dealers, who were urged on by an in-house magazine called the McMichael Messenger, which featured dealers from around the country. The 135 console is a five valve including the rectifier Superhet for use on AC mains. The valves used are:- AC/TP - MVPS - PEN-DD4 and 442BU. Printed on the front of the set is the PO licence number.